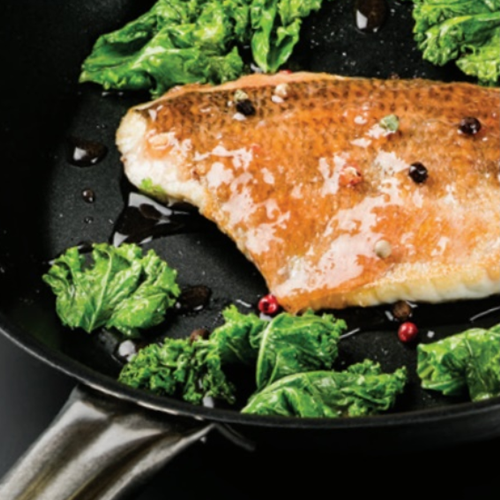 An essential piece of equipment in every kitchen, the humble frying pan! 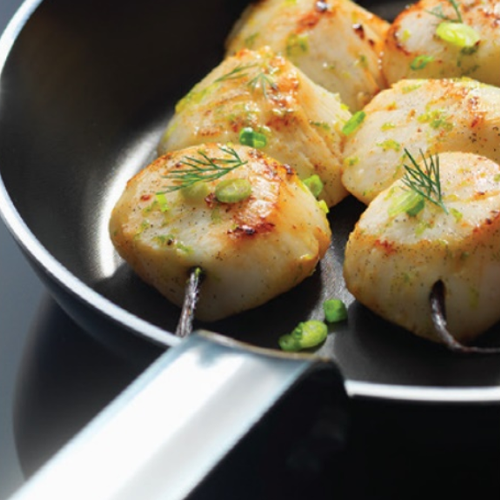 For over 30 years M&C has only sold one manufacturers frying pans, Matfer Bourgeat. Made in France to the highest specification that meets the demands of high volume kitchens such a hotels and Michelin Starred restaurants. 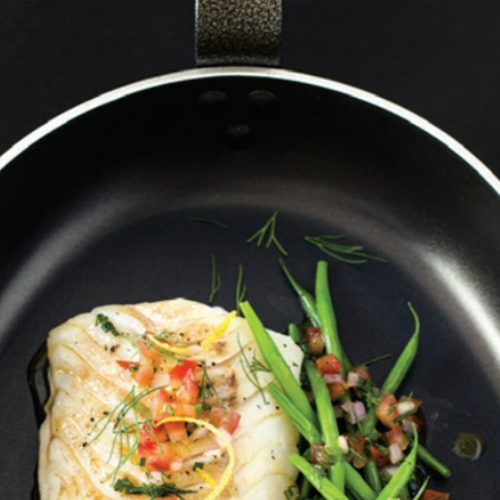 Bourgeat pans are the preferred choice of many well known and celebrated chefs across the world. 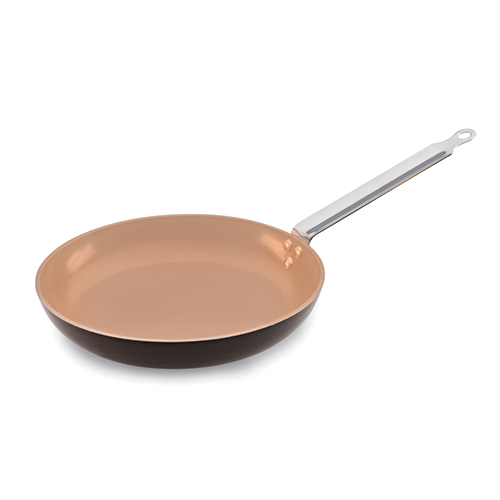 This broad range of professional non-stick frying pans takes into consideration various heat sources from traditional gas through to modern induction hobs. Five out of six models have stainless steel handles which make them suitable for in oven use and can also be dishwashed. 1. 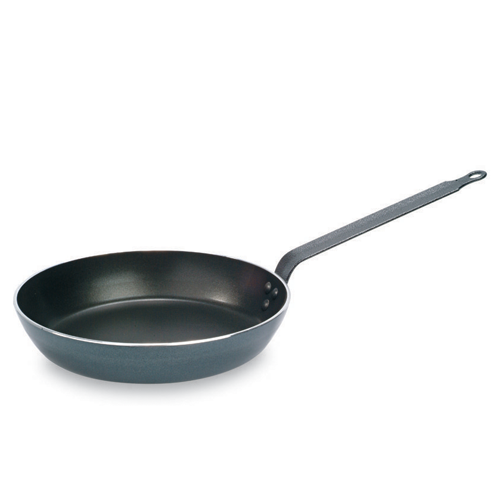 Different Materials - the majority of frying pans on the market are made from either Aluminium or Stainless steel or combination of both materials. Aluminium is a great heat conductor and is light in weight making it a popular choice. However Aluminium is non-magnetic so I can't be used with Induction heat sources unless it has a steel base applied to it. Stainless steel pans are naturally magnet and therefore work on all heat sources. 2. 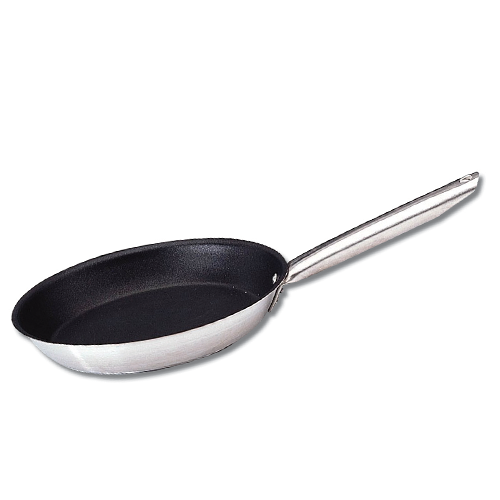 Pan Thickness - Bourgeat fry pans are measured in milimeters (mm) and generally the thicker the pan the higher the performance and durability. However the thicker the pan the longer it takes to reach heat performance but once there the performance can be maintained easier. Thicknesses range from 35mm on a 160mm diameter pan to 50mm on pans of 500mm diameter. 3. Handle Type - The typical handle for Bourgeat fry pans is the strip steel style either in stainless steel which is suitable for in oven use or epoxy coated (Classe Chef). This style allows for easy stacking when not in use and also allows the full length of the fore arm to stablise the weight of the pan when taken off the heat. Tubular handles are designed to be cool to touch. 4. Non-Stick Coating - Bourgeat pans are built up of multiple layers of non-stick coating to ensure durability lasts with intensive use. 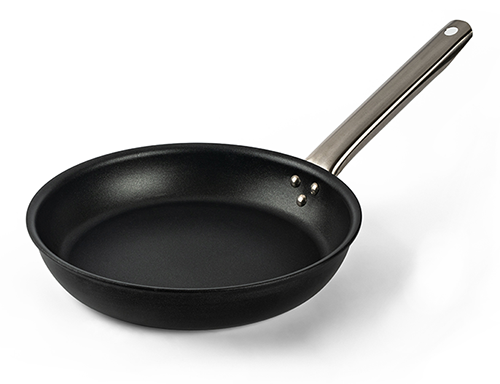 All non-stick are PFOA free, Perfluorooctanoic acid (PFOA) is a man-made chemical which was used in the process of making the non-stick material. PFOA can stay in the environment and in the human body for long periods of time. Studies have shown that people with workplace exposure to PFOA have a risk of bladder and kidney cancers. Although it should be noted that the level of exposure is very small. 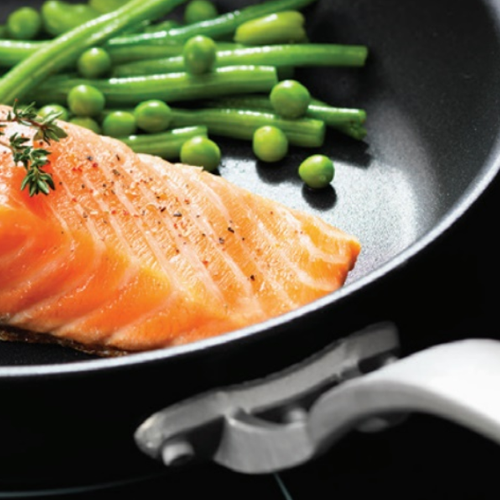 3 star rating, high quality finish with non stick coating on the interior and exterior with a stylish cool touch stainless steel handle makes this pan ideal for front of house cooking. Guarantees precise and even cooking on all hobs, including induction. In oven compatible and dishwasher safe. 2 star rating, high quality finish with non stick coating on the interior and exterior with stainless steel strip handle attached with 3 rivets. In oven compatible and dishwasher safe. Suitable for all hobs. Extra thick aluminium body with special induction base and 4-layer PTFE non stick coating with scratch resistant sub layer. Frying pans in this range: 200, 240, 280, 320mm. 3 star rating, Extra hard ceramic coating without PTFE, this range is suitable for all heat sources including induction hobs, meets all normal kitchen requirements. 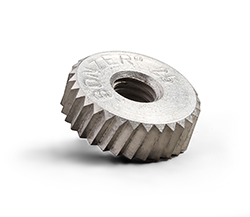 Resists high temperatures up to 400⁰C. In oven compatible and dishwasher safe. Suitable for all hobs. Thick aluminium body (40mm) with special induction base, PTFE free. 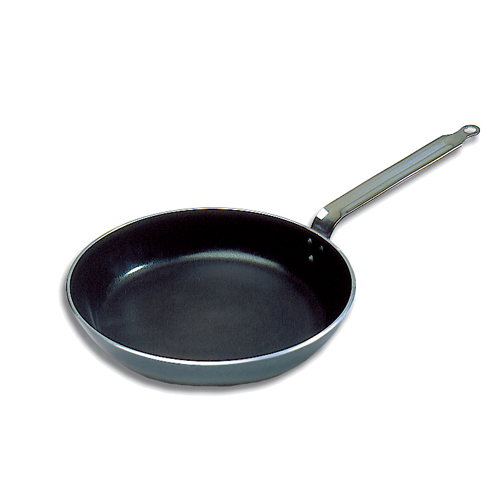 Frying pans in this range: 200, 240, 280, 320mm. 3 star rating, Stainless steel frying pan with heavy duty non stick coating for the most demanding of chefs. Recommended for fast cooking and searing of products. Can be used on all heat sources including induction. Round ergonomic ‘stay cool’ handle. Extra resistant Excalibur non stick coating. Special induction base, PFOA free. 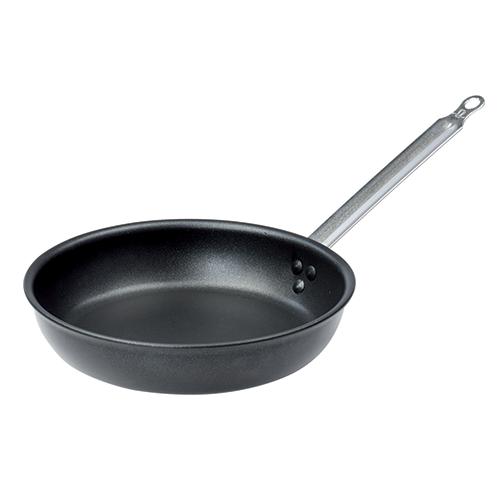 Frying pans in this range: 200, 240, 280, 320mm. 2 star rating, Traditional style French Skillet with a stainless steel handle which makes it suitable for in oven use and dishwashing. Recommended for cooking fish and white meats. Extra strong aluminium frying pan with 4 layers of non-stick coating, for intensive use. An extensive range includes: Blinis, Wok, rectangle, crepe, oval fish pan, flared saute and round in 6 sizes ranging from 200 to 400mm. Thick aluminium and multi-layer coating guarantee non-stick qualities and durability for this complete range of frying pans equipped with epoxy coated strip metal handles. Not suitable for in oven use or dishwashing. 4 layers of non-stick coating, for intensive use. An extensive range includes: Blinis, Wok, rectangle, crepe, oval fish pan, saute, Paella and round in 9 sizes ranging from 160 to 400mm. 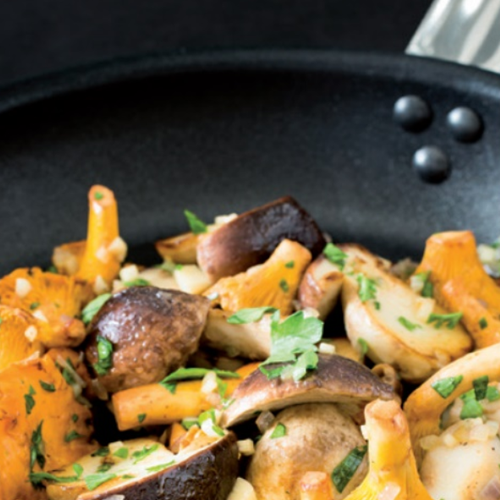 A non-stick frying pan will never last as long as a cast iron or steel pan but there are some steps you can take to prolong the life span of the pan. 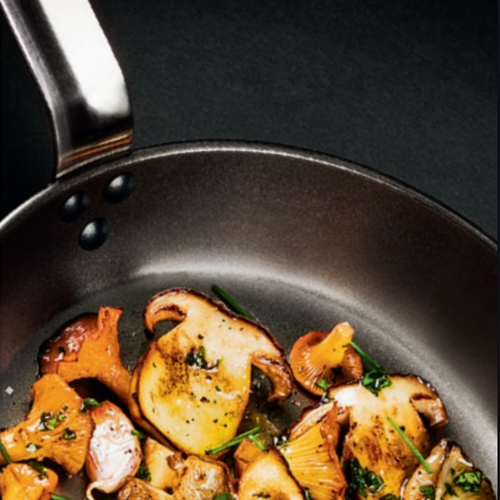 Non-stick pans will scratch and get damaged if metal utensils are used so it is a good idea to use high heat plastic utensils which won't scratch the bottom of the pan and due to their high heat properties they can be left in the pan during use. Matfer (Bourgeat's sister company) make a wide variety of high heat utensils made from Exoglass. These include: Exoglass Spoons, Exoglass Pelton Plain Bent Spatula, Exoglass Pelton Perforated Spatula and Exoglass Spatula. Do not overheat the pans: 250ºC maximum for PTFE pans and 400ºC for Ceramic. The higher the heat the faster you deteriorate the pan. Clean with non-abrasive sponge.